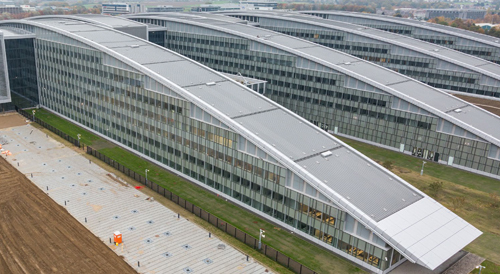 The new impressive NATO headquarters was designed by the American firm Skidmore, Owings & Merrill (SOM), which designed the Burj Khalifa in Dubai and the Time Warner Center in New York, among others, and ASSAR Architects from Belgium. 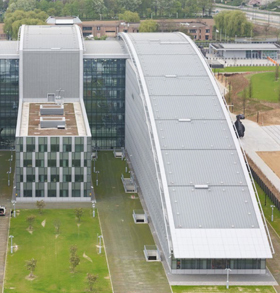 The wedge-shaped headquarters comprises eight wings, which, SOM explains, interlock, thus symbolising the changing role of NATO since the end of the Cold War. Since then, the Alliance has increasingly evolved in the direction of integration and unification, with 28 permanent members and 19 partner states. The eight wings, each 200 metres long and 18 metres wide, are fitted with a curved roof, as well as seven transition pieces above the connecting section, the 38-metre-high agora. In total, the roof spans no less than 35,000 m² in sleek standing seam bays of NedZink NOVA Pro-Tec. 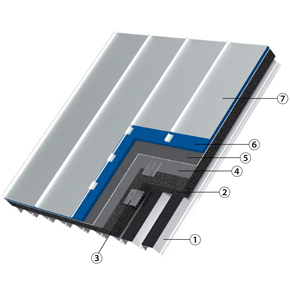 The roof construction consists of a steel deck with profile sheets used as a support structure, and subsequently, a 100-mm layer of Foamglas with the zinc standing seam bays fixed on top. The Foamglas guarantees a vapour-proof roof construction. The Foamglas system is thinner and can be used in virtually any shape. 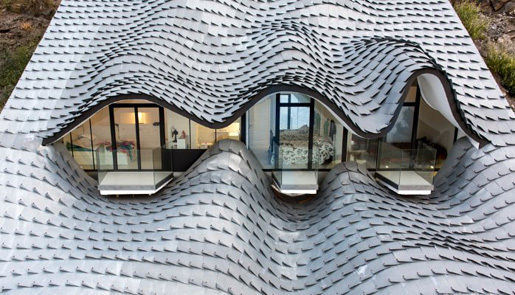 There are hardly any limitations with regard to the form, gradient, or length of the roof surface. The system is ideal for standard NedZink material and NedZink NOVA Pro-Tec with a coating on the back. NedZink NOVA occupies a unique position on the market. NedZink NOVA is a processed, pre-weathered, titanium-zinc produced using a chemical surface treatment applied after the rolling process. The result is a matt, brushed surface in a natural grey colour. Since work on the NATO headquarters had to be performed at a height of 38 metres, NedZink supplied the NOVA Pro-Tec at the construction site in coils. Standing seam bays were subsequently profiled on the ground floor, in lengths of 26 metres, lifted on to the roof by crane, and secured with clips. It took over three years to manufacture this gigantic roof, and work was carried out between 2013 and 2016. All in all, it was a highly challenging project. At NedZink, quality and service take centre stage. 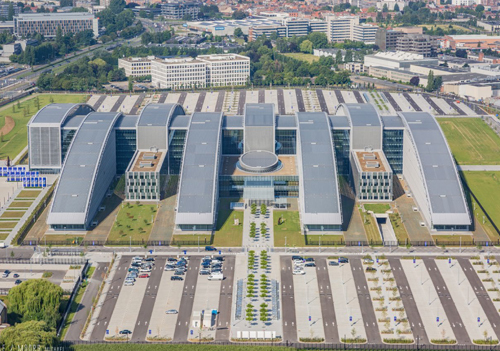 With the knowledge that extremely high requirements applied to this unique project, in terms of the quality of the products used and their processing, the Brussels NATO headquarters serves as incredible recognition for NedZink. It has elevated NedZink to a higher level.